Facebook’s phenomenal 15 years of growth means its hard to remember a time when the social network wasn’t ubiquitous. The company has never not been controversial – the bigger it gets the greater the controversies. Facebook’s own chief operating officer, Sheryl Sandberg, has admitted that the social network has a job to do to win back public trust, especially after data protection and data-sharing scandals. Even so the wave of growth continues largely unchecked – there are no fewer than two billion users – regardless of policy makers’ fears about market dominance, privacy campaigners’ opposition to the tracking of Facebook users’ (and even non-users’) connections, or the role of the company’s platforms in disseminating at times false news to targeted user groups. Facebook’s birth pangs have already been immortalised on the big screen in ‘The Social Network’ and at one stage not that long ago its founder, Mark Zuckerberg, was talked about as a possible candidate to be president of the United States. ‘Zuck’ set up Facebook with fellow Harvard students Dustin Moskovitz, Chris Hughes, and Eduardo Saverin. The billionaire Zuckerberg remains CEO and chairman. Employing 35,500 worldwide, the social media giant is one of Ireland’s biggest private-sector employers, with close to 7,000 staff in Dublin. Last month it said it would add a further 1,000 jobs this year at its new European headquarters, currently under development on the site of the AIB Bank Centre in Ballsbridge. Even as Facebook itself drifted out of fashion the scale of its early profits gave the company the means to gobble up its own successors. It bought photo-sharing app Instagram in 2012 – beloved of the trendier, younger and female audience beloved of advertisers. In 2014, it splashed out €16.6bn on WhatApp – the closed social network used by families, clubs and neighbours for the kind of messages they prefer to keep off their more public Facebook pages. In the background it built and bought technology that has given Facebook an ability to collect, slice and dice consumer information rivalled only by Google. In its most recent earnings update, for 2018, the company had 2.3 billion monthly active users, almost half of them in Asia, although for now revenue comes mostly from North America and Europe. That revenue was $56bn in 2018, a jump on the $41bn in sales reported by the group for the comparison period in 2017. The vast majority of that income is generated through advertising, with just $825m generated from “payments and other fees”. 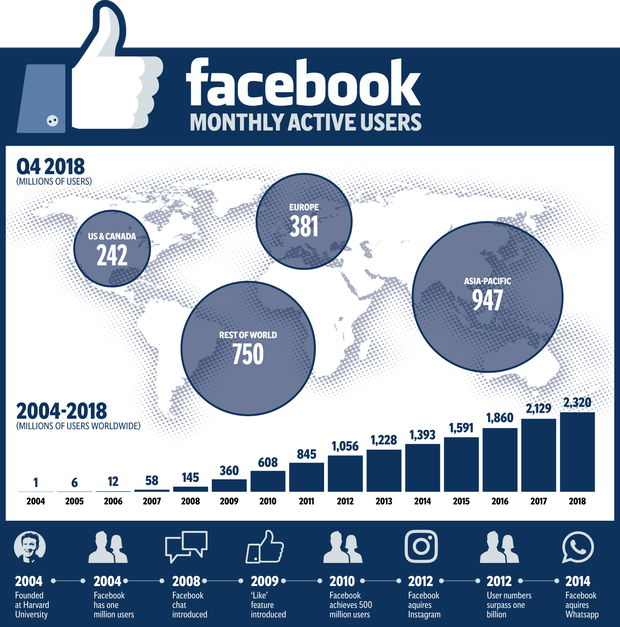 Given that Facebook’s growth has shrugged off every controversy to date it’s hard to see what can check its advance – saturation perhaps – or more likely a delayed regulatory reaction.